Research Dissemination and Policy Workshop on: Labour Outmigration, Agriculture Change and Consequences for Left Behind Women. A one-day Research Dissemination and Policy Workshop on: Labour Outmigration, Agriculture Change and Consequences for Left Behind Women. Was conducted on December 18, 2017 at Hotel Shanker, Kathmandu, Nepal. The workshop was jointly organized by the Institute for Social and Environmental Research-Nepal (ISER-N), the Agriculture and Forestry University (AFU) in Nepal, DFID-ESRC Growth Research and the Population Studies Center (PSC) at the University of Michigan (UM), USA with financial support from the Overseas Development Institute (ODI), UK. The goal of the workshop was to share the empirical findings generated through rigorous scientific investigation of labour out-migration, agricultural change and its consequences for left-behind women and foster policy dialogue to integrate findings with policy. Additionally, the workshop also aimed to facilitate cross-disciplinary interaction among scientists and research scholars, crucial for building a foundation for interdisciplinary research, education and public policy. Altogether 45 participants representing various agencies participated in the workshop. A one-day stakeholder workshop on “Integrating Social and Agriculture Sciences: Building the Foundation for Interdisciplinary Research in Nepal” was conducted on November 30, 2014 at Hotel Himalaya, in Lalitpur, Kathmandu, Nepal. The workshop was jointly organized by ISER-N, the Agricultural Forestry University (AFU), and the Population Studies Center (PSC) at the University of Michigan. The primary goals of the stakeholder workshop are to foster intellectual interaction among potential consumers of the evidence that this project will generate through rigorous scientific investigation as well as to gather stakeholder feedback. This project aims to build a foundation for interdisciplinary research, education, and public policy. We believe the first step in accomplishing this aim involves engaging all potential stakeholders-local, regional and national-from the very beginning of the project. This workshop and the resulting report document a crucial first step in the life of this project. 1. Baseline Household Agriculture Survey The survey was initiated in July 2015 and was completed in September 2015. The survey collected retrospective information on land holdings, agricultural practices, crop yield production, livestock, family members migrated and remittance obtained. The data collected has been archived and secured. 2. 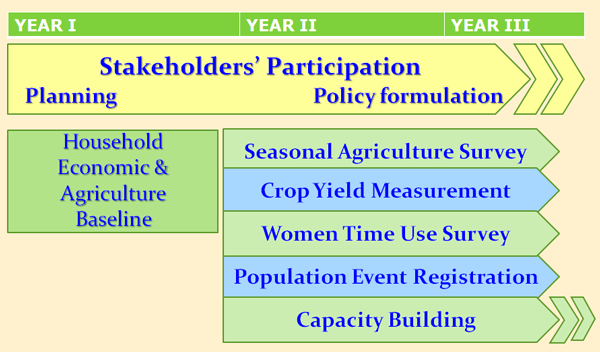 Seasonal Agriculture Survey-1 After the baseline, the agricultural production data was collected on a seasonal basis, as proposed. The first follow up survey, named Seasonal Agriculture Survey-1 was conducted in October 2015 and completed in December 2015 with 99% response rate. 3. Seasonal Agriculture Survey-2 The seasonal agricultural survey for the next season (Season 2) was initiated in February 2016 and completed in April 2016 with 99% response rate. 4. Seasonal Agriculture Survey-3 The third round of survey of the agriculture survey is currently running. The data collection initiated in July 2016 and is proposed to complete in September 2016. Demographic Monitoring and Women’s Time Use Survey The individual survey for Women’s time use are also conducted on a seasonal basis. Thus, time 1 and time 2 surveys are completed and currently time 3 survey is being conducted. The time 1 and 2 surveys were completed in November, 2015 (response rate 98%) and March, 2016 (response rate 95%) respectively. 1. Rice Completed in November-December, 2015. Measurement in altogether 524 households. 2. Mustard Completed in February, 2016. Measurement in 196 households. 3. Lentil Completed in March, 2016. Measurement in 149 households. 4. Wheat Completed in April, 2016. Measurement in 114 households. 5. Maize Recently completed in July, 2016.